A view of the side of the leg bath. Note the rope-style design printed on the handles. 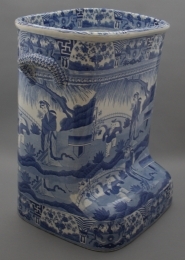 An earthenware leg bath printed in blue with the Lange Lijzen pattern, also known as Long Eliza. This attractive middle-period production pattern comes from a Chinese Export design, possibly by way of Dutch delftware, as the name might suggest. The Chinese pattern from which this pattern was inspired dates from the K'an Hsi period, 1700-1722. According to Robert Copeland, it is one of the most interesting examples of medical ceramics made by Spode; reference Spode's Wilow Pattern and Other Designs after the Chinese, p. 143.